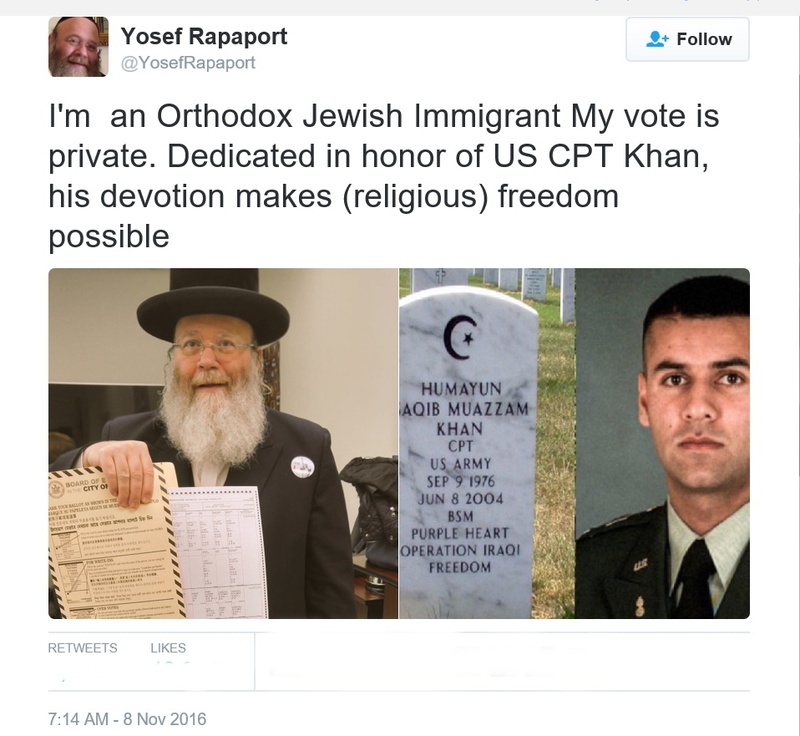 New York - An election day tweet advocating for religious rights for all minorities, showing a Chasidic man holding his ballot next to a picture of fallen Muslim soldier, has exploded on Twitter, drawing comments from all over the world supporting the message of unity. Yosef Rapaport, media relations coordinator for Agudath Israel of America, posted a tweet this morning bearing the words, “I’m an Orthodox Jewish immigrant My vote is private. Dedicated in honor of US CPT Khan, his devotion makes (religious) freedom possible. The tweet included a picture of the beaming 62 year old Rapaport next to a images showing both the face and the headstone of Captain Humayum Khan, a Muslim soldier who died in 2004 at age 27 in an Iraqi suicide attack. As previously reported on VIN News, Republican presidential candidate Donald Trump was roundly criticized for making negative remarks about Khan’s parents who appeared at the Democratic National Convention in July (http://bit.ly/2fQwopT). Rapaport told VIN News that his tweet didn’t attract much attention at first but momentum built steadily after his message was retweeted by Yair Rosenberg, a writer for Tablet magazine who is one of several Jewish journalists to be targeted with anti-Semitic messages on social media during this contentious election season. Rapaport said that his tweet found its way across the globe and, much to his surprise, was retweeted by J.K. Rowling, author of the Harry Potter series. “This is a wonderful thing. #ElectionDay,” tweeted Rowling, along with an emoticon of a vote being dropped into a ballot box. Rowling’s tweet was liked by more than 4,400 people and retweeted just over 1,000 times as of this afternoon. Many of the comments to Rapaport’s tweet, which was liked by over 9,400 people and retweeted more than 4,500 times, were deeply emotional. “This made me tear up as I stand in a long line waiting to vote in NYC,” read a tweet posted by an individual identified as Lisa M.
“Much respect brother,” tweeted Nael Sanaullah, who identifies himself as a Pakistani-American. In crafting his tweet, Rapaport said that he looked for someone who symbolized religious freedom. Rapaport said that he has been receiving emotional messages all day about his tweet, quite of few of which came from Arabs living in the Middle East. Others came from soldiers who were grateful for his message of unity, including a retweet from a former member of the armed forces whose wife died while serving in the military. I don't use social media but if I had an account I'd tweet that I voted in memory to all those lost in Benghazi. As a public representative of a nonprofit organization, he should know better than to even imply to the public who he voted for. Yup now try walking with your peaceful muslim brothers in east Jerusalem and see if its safe. No, kiddush hshem but i'm still not voting for hillary !!! Thank you Mr. Rapaport for this gesture that gives us an ounce more of decency, humanity and unity. That this message came from a Hassidic Jew bears more weight at a time when intolerance and hate is shamelessly promoted and supported by many Americans who should know better! Wow. The stupid comments are coming from us Jews. Nice. What an idiot. Looks like he backed the wrong horse. Mr. Rapaport we all are for religious freedom and unity. It's in the Muslims Koran that infidels should be killed and according to them you are an "infidel" and that's what they teach in their schools here in North America. Golda Mayer was once asked if there will ever be peace with the Arabs she answered "YES when the Arabs will love their children more than they hate us". Not all Muslims are terrorists but most terrorists happen to be Muslims I wonder why. Anyway appeasement never worked.